Yachting in style! The yacht seats 5 people. She has 2 front row seats and a 3 people 2nd row bank. The hand crafted steering wheel is located behind a beautifully classic shaped dashboard which reminds you of a historic Porsche 356 interior. She is a brand-new yacht and can be ordered with all optionals you prefer and in different color inside-out options. Light weighted she is perfect for the use of a superyacht tender or using her as a family-boat while trailing it easily with her very own trailer. Hull is built in glass- and carbon fiber. OVERALL STATUS: >SELECT HER YOUR WAY! The boat is mystically powered by a powerful, but very low consumption WEBER-gas engine and has a jet-drive for maximum performance up to 45 mph and maximum bathing security. now for sale: 85.000 EUR+VAT, including luxury package! Total number of people being transported is 5. We have all information ready for interested persons. Viewings on site and handover can be made in our dependance near Düsseldorf, Germany. 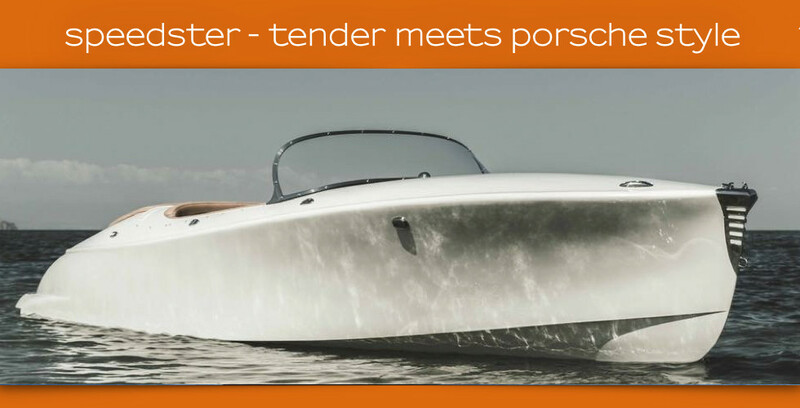 This entry was posted in featured yachts, motor yachts, news, tender & toys and tagged 22.0ft, 6.7 meter, classic style, design, for sale, greek shipyard, high performance, jet drive, leather interior, low consumption, motor yacht, new, super light weight, superb quality, superyacht, tender, toy, trailer, weber. Bookmark the permalink.